The model has the basic mistake, that the greenhouse effect is not considered. The assumptions used for 280 ppm can be made – but doubling the concentration to 560 ppm has an impact on the greenhouse effect. The surface temperature can be assumed with 303 K, the temperature of the layer 10 is then 211 K and the average pressure of layer 10 is reduced (for example 97 Pa), because the rises of height of tropopause. These changes result from the higher disability rating of radiation propagation through more CO2 while maintaining the total radiation of all wavelengths. The cumulative curve is beginning with a higher performance by level 0 and larger slope at the upper end. I think the calculation with the transmission is counterproductive, because where is strongly absorbed, is also emitted strong. A calculation with intensities that are much higher than the intensity of thermal emission, says nothing: The absorption onto the Beer-Lambert law neglected the thermal emission – only the radiative transfer equation is considered for the thermal emission, only by neglecting of the thermal emission in the radiative transfer equation is the Beer-Lambert law correct, ie the intensity change by the use of Beer-Lambert law requires intensities that are far above the actual intensities and therefore unrealistic. The results are deliberately shown with the same surface and atmospheric conditions. So the intent here is to show how the same atmospheric conditions but different concentrations of CO2 cause a change in outgoing radiation. For people familiar with the basic physics this is, of course, very obvious and not so interesting. For people getting to grips with the physics of radiative transfer this is essential knowledge. What wavelengths cause what changes and so on. 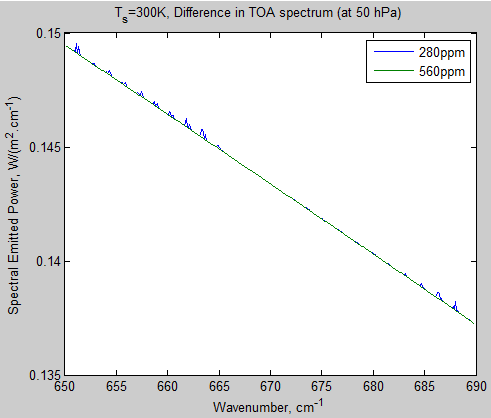 Comparing with fig 12, we can see the fine difference in atmospheric radiation at TOA when the simulation (for 280 vs 560 ppm) is run at Δv = 0.01 cm-1 vs Δv = 0.1 cm-1. The view zooms in on one wavelength region of 580 – 590 cm-1. 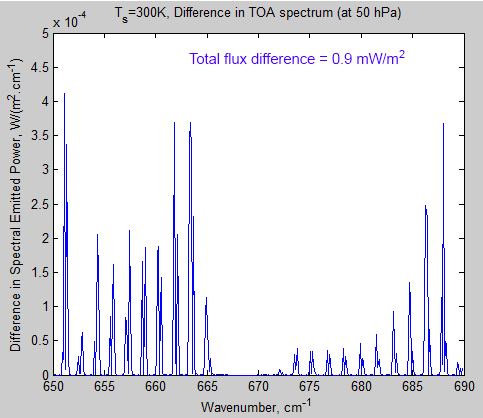 In terms of total upward flux at TOA, the calculated value is the same whether the atmosphere is evaluated at 0.1 or 0.01 cm-1. What’s the change in downward flux to the surface. That would answer almost directly some of the recent questions presented in other threads as far as this model is considered representative for the whole atmosphere. Do you mean the DLR for the difference of Δv of 0.1 cm-1 vs 0.01 cm-1? If so, the answer is also 0.0 W/m2. Or the change as a result of introducing the diffusivity factor to the continuum? I plan to do a separate article on the downward flux. I meant the effect of doubling CO2. I did my own calculation with slightly different input (and a little modified model with 10 azimuthal segments). That gave an decrease of 5.05 W/m^2 in the flux up at TOA, 3.24 W/m^2 in flux down at surface and thus a net rate of 1.81 W/m^2 was left to warm the atmosphere. This simple clear atmosphere model gives a high value for the forcing, but what I had in mind was the point that about 64% of the warming goes initially to the surface and 36% stays in the atmosphere. Due to the smaller heat capacity the atmosphere warms at that point much faster but that will soon affect convection, and at that stage the energy the atmosphere takes in further warming is very little. What’s initially 64% is soon almost 100%. That gave an decrease of 5.05 W/m^2 in the flux up at TOA, 3.24 W/m^2 in flux down at surface and thus a net rate of 1.81 W/m^2 was left to warm the atmosphere. That sentence reads flux down at the surface decreases. That must be an increase or the net wouldn’t be smaller. That’s a rather large increase in flux down for doubling CO2. That’s what I would expect to see for very low humidity, like the sub-Arctic winter atmosphere. You’re right. The flux down to surface increases. Words “.. and an increase ..” were missing from my previous message. In this calculation the boundary layer humidity is 80% and the top of the boundary layer at 920 hPa / 400 m. Above that altitude the humidity is 40%. I haven’t paid much attention to the parameters. Thus the values are perhaps the most appropriate ones. However well the model is made to calculate the radiative transfer, it’s still based on one clear sky profile only and therefore not quantitatively right for global averages of the real Earth system. That profile would give very low total column precipitable water for a surface temperature that high. Looking at the different profiles, only the US 1976 standard atmosphere likely has total column water that low. At 300 K, you get ~+2.5 W/m² increase in DLR for doubling CO2 and a reduction of 4 W/m² at the tropopause looking down. It makes me suspect that there might be a problem with the water vapor pressure calculation. I haven’t studied any part of the code related to water vapor, just used the code as SoD has written it. The moisture levels are also the same he has been using. – I read the HITRAN data from text files downloaded from SpectralCalc rather than HITRAN-files directly. – I have added the possibility of separating segments of different azimuthal angles. In many runs I use ten segments as the program runs fast enough even with those (the most time consuming step need not be modified for that). It turns out that this added complexity makes little difference for the results. (The up and down fluxes change by +0.4 and -0.5 W/m^2, when 10 segments are taken into use rather than one with diffusion factor 1.66). When I use more closely his parameter values the changes from doubling CO2 are -4.2 W/m^2 up and +2.8 W/m^2 down. Can I see the code for the different azimuthal angles? Did you do this rather than use the Zhao & Shi method, because it’s potentially more accurate? At the end the function returns the vector mixh2o() so the mixing ratio by volume can be seen for each layer. I just sent it to you (before I read this message). 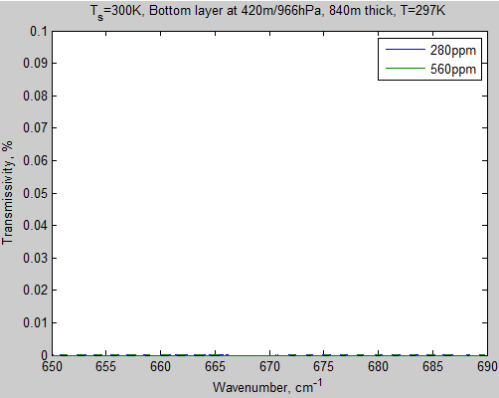 Here are the mixing ratio values (%) for a 10 layer model with a surface temperature = 288K, BLH = 80% and FTH = 40%. You asked also for the preference of this over Zhao and Shi. When I realized that the extra computational work is not too heavy, this approach seems clearly preferable. Using this approach the whole diffusion approximation can be dropped as the path-lengths are real path-lengths, not parametrizations. The need of using some “fudge factor” like 1.66 is not there any more. From practical point it’s nice to see that the simple diffusion factor of 1.66 works so well, while it’s a little disappointing that the theoretically better method is so little better in practice. Differences are so small that they can be ignored for most purposes. There are certainly again some detail results where the difference is larger. One example is the spectrum of radiation that escapes directly from surface to space. That’s a quantity for which I get quite different results from some early calculations and from my present version. I’m not quite certain on the reason. There may be an error in either one calculation. That’s anyway just one of those “curiosity values” as it’s not possible to tell in reality what’s the point of emission of each photon. The diffusion factor is certainly important for that, but in this case we know by definition that the photons must traverse the whole atmosphere. Thus the angular dependence of the optical thickness is also known exactly and can be used in a separate calculation as I have done. There’s certainly a risk that my code has errors, but the results are, in general, in good agreement with expectations. In particular it gives exactly the same results as your code, when the 1/cos(theta) factor is replaced by 1.66 for all angles. As I expected, your atmosphere is really dry. Here’s a comparison of water vapor mixing ratios with pressure for your atmosphere and the US 1976 standard atmosphere with humidity corrected to a surface temperature of 300 K. If I did my sums correctly, the total water vapor content in atm cm for your atmosphere is 2597 compared to 3855 for the US 1976 standard atmosphere relative humidity profile at the same surface temperature. I plugged in the numbers for the boundary layer, 80% RH, 297.4 K and 96616 Pa, the calculated water vapor mixing ratio was 1.6076% w/w or 2.5847% v/v. Something’s wrong somewhere. I somehow missed that the surface temperature in your table was 288 K. The web site calculated volumetric mixing ratio for 285.4 K and 966.16mbar is 1.19945% compared to your 1.1785%. That’s not far off. So your atmosphere is wetter in the boundary layer and dryer at higher altitude with ~2 cm precipitable water compared to ~1.4cm for the US 1976 atmosphere. Quite high on my list of things to do with this model is to run it with some US standard atmospheres. Do you have the data (atmospheric temp & water vapor mixing ratio or RH) available in a convenient table, at the tropospheric resolutions I’d need (at least 10 layers in the troposphere)? I haven’t looked very hard but when I did look some time ago I found the data up to 100km but not at all good resolution for the troposphere. MODTRAN will give you 1 km resolution up to 25 km and then 5 km to 50 km. Just click on the ‘view the whole output file’ link at the bottom of the right hand pane after you submit the calculation for a particular atmosphere. All the spectral data are there too. The spectral data, however, are only for the selected observation height and direction. Also, the atmosphere data are for the specified surface temperature. If you change the surface temperature, you really need to change the atmosphere pressure profile too which will change the number densities of the various molecules. MODTRAN only changes the temperature up to 13km when you change the surface temperature offset. It probably doesn’t make much difference for small changes in temperature. This allowed for calculations. But then you have to point out that the energy balance is violated in any height. This violation of the energy balance is stored in the atmosphere – and leads to temperature changes at the new temperatures lead back to the energy balance. The integration over all angles is not spread as Beer-Lambert law, but the Exponential integral function. The exponential integral is obtained from a calculation of transmission trough a single layer of given thickness. It cannot be applied exactly to the succession of several layers because it cannot describe properly the probability of photons passing trough several layers. The approach of handling the azimuthal angle as an extra parameter does this as well. Therefore this approach is fundamentally correct while the use of exponential integrals remains an approximation in the multilayer case. Doing the calculation of transmission trough one layer having the azimuthal angle as one variable leads exactly to the exponential integral when integrated over azimuthal angles. The numerical method based on a few discrete values for the azimuthal angle is naturally an approximation but it’s accuracy can be improved by increasing the number of these discrete values. It’s easy to find out empirically, how many values are needed for accurate enough results. That number seems to be rather small. If I remember correctly, Miskolczi used either seven or nine azimuthal angles in his LBL program. As far as I know, there’s nothing wrong with his LBL program. It’s the rest of his theory that leaves something to be desired. Miskolczi has 9 azimuthal angles. I have also got the impression that his radiative calculation is correct, or at least I haven’t found anything wrong in it. Concerning his 2010 paper it’s a bit strange that he gets so far essentially correctly and then just misses the opportunity of reaching reasonable results on GHE by doing one more very simple step correctly. Out of interest, what’s the corresponding figures for the next sets of doubling? eg, 1120, 2240, 4480ppm? I think it’s about 4 W/m^2 of increased absorption per incremental doubling. I checked using my version of SoD’s model what repeated doubling does for the TOA OLR intensity for three standard profiles: tropical, mid-latitude summer, and subarctic summer. 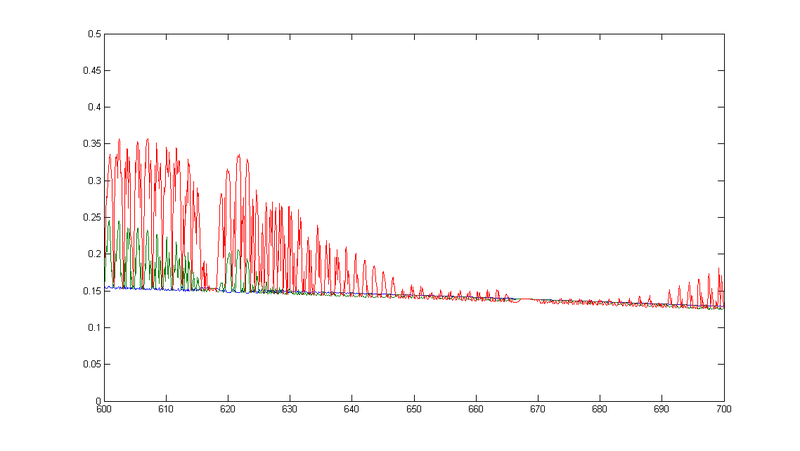 On linear scale the results look like this, and with logarithmic concentration axis like this. Highest curve is from tropics and lowest from subarctic. We can see clear saturation on linear scale as expected, but the plot with logarithmic scale tells that the saturation is not as strong as what a logarithmic dependence on concentration would predict. That’s not really surprising as the logarithmic law is not derived from accurate theory but has been described as a qualitatively good fit to some model results. Results from models can be presented in many different ways. Some other quantities might behave more linearly as function of the logarithm of the concentration. Plotting on a log10(CO2) scale gives a nearly straight lines (R² = 0.996) with slopes of -15.4, -13.2 and -10.6 W/m²/decade. SoD’s model is not a band model but a sampling line-by-line model. Band models may produce systematically biased results while a sampling line-by-line model has larger random errors without bias. I did my earlier calculation with a 1 1/cm grid. Then I redid some of the calculations with a 0.1 1/cm grid. The results changed a little, but not enough to make any difference for the present discussion. I*m still wondering, whether I have missed something, but haven’t found anything. I created two pictures from the model output that tell, how complex the effect is. All this is based on the AFGL mid-latitude summer profile. 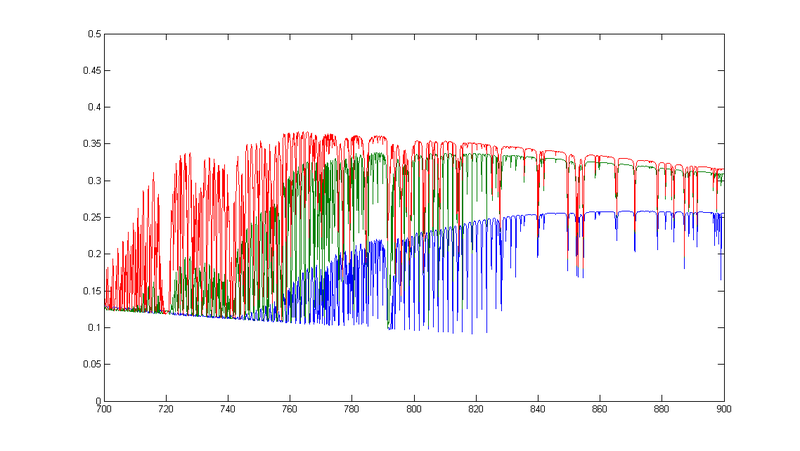 The first graph shows the flux up at 20.5 km calculated with a resolution of 0.1 1/cm over the range 600-700 1/cm. The red line corresponds to 100 ppm, green to 1000 ppm and blue to 10000 ppm. We see that the blue line is very smooth. The concentration is high enough to lead to high opacity over the whole range. A little off from the line center the 100 ppm case does already deviate significantly while 1000 ppm leads still to high opacity. Below 630 1/cm also the 1000 ppm case starts to differ significantly from the 10000 ppm case. The general conclusion from the range 600-700 1/cm is that the saturation is stronger than logarithmic, i.e. the red curve differs from the green more than the green curve from the blue. The second graph is over the range 700-900 1/cm. Here we see that the situation is reversed above 750 1/cm. The green curve is now closer to the red one than the blue one. Over this range we don’t have strong saturation at all but this range is very important in the continuing influence of more CO2 at concentration above 1000 ppm in the model calculation. One may wonder, what’s the origin of this smooth difference that contributes so much to the overall result. We see few individual absorption lines in this range. 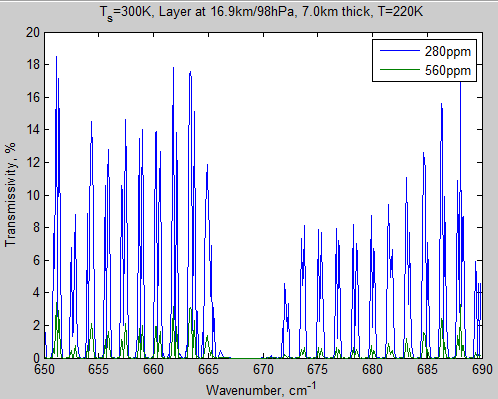 Thus it must come from the relatively fat tails of the main absorption peak around 667 1/cm according to the Lorentz profile. I’m not at all sure that the Lorentz profile can be used so far from the peak as it’s an idealization based on time between collisions of molecules, whose structure is not taken into account. 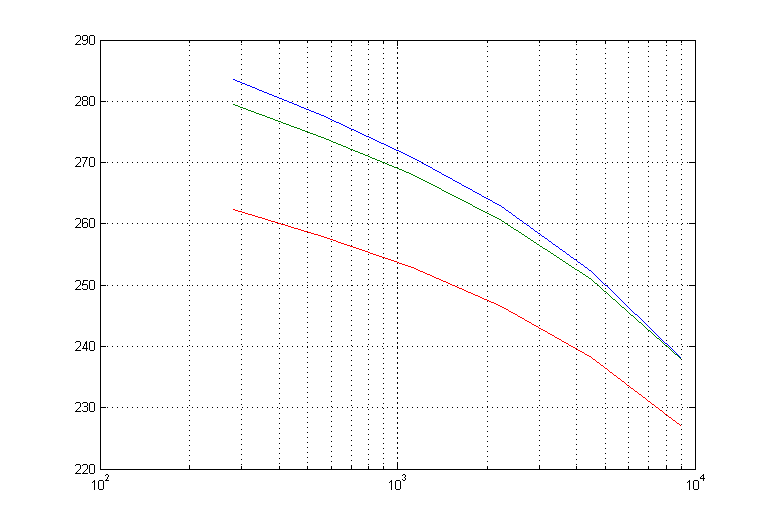 Some cutoff should be applied to the Lorentz profile, and the proper scale for the cutoff could be a few tens of 1/cm. Thus this result may, indeed, be spurious, but I don’t know quantitatively what would be the right way of introducing a cutoff to the Lorentz profile. This problem with the tails of the Lorentz profile has little effect at present concentration (it’s still small at 1000 ppm), but affects strongly the results above 1000 ppm. Rechecking DeWitt’s message, the bandwidth of the MODTRAN3 calculation is 2 1/cm, which makes it even more suspect for this kind of calculations. I cannot say that the results are finally wrong, but neither would I trust the results in calculations in a range where their correctness has not been verified by comparisons with a more accurate model. In this paper Takagi et al compare several profiles that add cutoff to the Lorentz profile in calculations of Venus atmosphere. Their conclusion is that a cutoff is needed, but also that the strongest proposed forms of the cutoff (or sub Lorentzian profile) seem to be too strong. The bottom of the dip is lower in MODTRAN as well, ~0.10 compared to your 0.15. I’m betting it does the same below 600 cm-1 as well because emission in MODTRAN starts increasing below about 630 cm-1 at 10000 ppmv CO2 while you have a flat line from 600-700. That’s exactly what I said about that issue. As far as the correct cutoff is not known, neither the MODTRAN results nor my results are correct on that point. We just don’t know the correct behavior at high concentration. My other and separate point is that one cannot trust the MODTRAN band model at high CO2 concentration even in the range closer to the absorption peaks unless it’s validity has been verified also at high concentration. The band model is a biased approximation. The bias may be small, but that must be checked separately by a comparison with a line-by-line model. As I tried to make clear, my results are not correct, but most probably the MODTRAN results are not any more trustworthy beyond the range, where they have been explicitly validated. Both models calculate correctly according to their specifications, neither is developed to perform well at 10000 ppm. As the Takagi et all paper tells, the issue of cutoff becomes important in the case of Venus atmosphere, but the correct line shape is not known. I went to Spectralcalc ( http://www.spectralcalc.com ) and calculated what I could for free. I used an 8 km path length, 1013.25 mbar total pressure and 296K, sort of worst case. The transmittance at 860 cm-1 is greater than 90% for a VMR of 0.01 or 10,000 ppmv. If there were significant contribution from the wings of distant lines at that frequency, it certainly would have been noticed when the weak lines between 800 and 900 cm-1 were measured using techniques like cavity ringdown. If your program disagrees with MODTRAN and Spectralcalc, it’s vastly more likely that your program is wrong. Your results are therefore not evidence that the effect of higher levels of CO2 isn’t logarithmic. A result that far out of line would prompt me to try to fix it rather than wave my hands and say that the other programs are probably wrong too. Certainly well known models like MODTRAN are likely to perform better than a “toy model” or educational model built on the most simplistic line shape for the tails. I did also write in an above comment that a cutoff is to be expected roughly on the scale of tens of 1/cm as such a cutoff corresponds to the size of the molecules. The present MODTRAN5 has been improved very much since MODTRAN3. Thus it’s likely to be better verified also on results that depend on far tails. The original question was, what does SoD’s model predict. I believe that I have now answered that question ans also explained why it differs from MODTRAN results. Even so I have still some doubts on the accuracy of MODTRAN as well at high CO2 concentration. Tools like MODTRAN are developed to work well over the range where they are needed in practice. Whether that has led to validation of it over the range of interest here is not that obvious. I would certainly like to see direct information on research focused on the line shape of CO2 peaks far from their center. The Takagi et al paper seems to tell that the uncertainties have not been resolved. I found some further information on the CO2 line shape. There are several papers on the accurate line-by-line model LBLRTM, where this issue is discussed. This poster by Shephard et al has a picture and comments on Chi Factor, which is the cutoff multiplier. The factor chosen for the use in the model is shown in red. The cutoff starts to have a sizable influence a few 1/cm of the peak, somewhat earlier than I expected based on rough semi-quantitative estimates. The strength of the resulting CO2 continuum is greatly suppressed by the introduction of the chi factor. It’s likely that MODTRAN development has taken advantage of more accurate models like LBLRTM on this point, how far that’s true for the old MODTRAN3 is less certain. Some interesting LBLRTM model results on radiative forcing are presented in a 2008 paper by Ianoco et al.. There they report that the broadband models of the same group (AER) reproduce well the results of the LBL models over the range relevant for global warming studies. 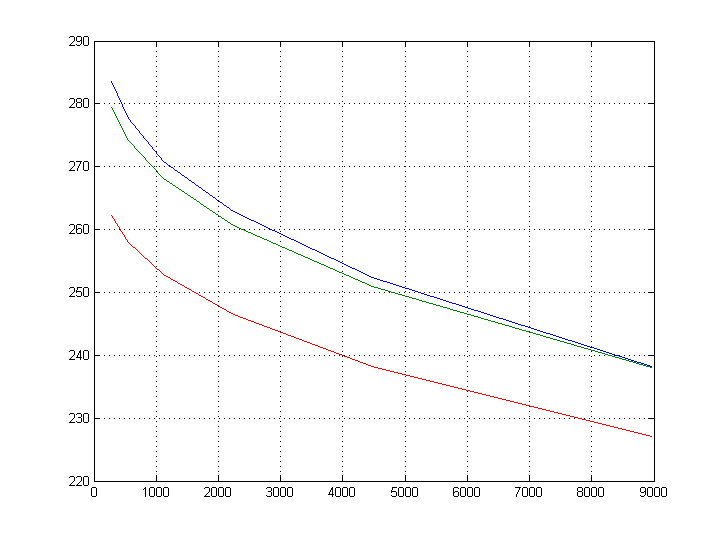 So a more up to date calculation shows radiance falling off a little faster than MODTRAN3, but not that much. So a log plot would be curved, but nothing like as drastic as yours. 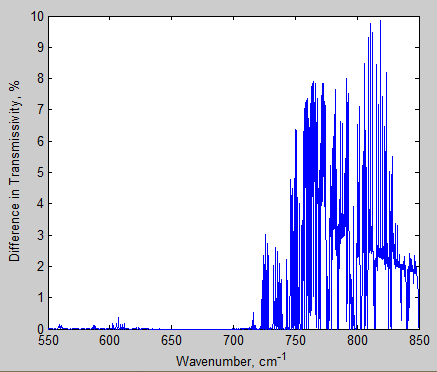 As expected, the radiance at frequencies greater than 840 cm-1 doesn’t change with CO2 concentration. I can load the files and graphs into a public folder in Dropbox if you want them. I can do different nadir angles too. I have stated repeatedly that my results are not valid for real atmosphere. They tell the outcome of SoD’s model, because I use his model (with some additions that were not activated in these calculations). There’s no point in arguing on that. What I did say in addition is that even the best known and most reliable tools are reliable only within the limits they have been built to be reliable and validated. It’s not at all obvious that the UChicago implementation of MODTRAN3 is reliable in these calculations, although it surely is more correct than SoD’s model. My calculation with SoD’s model was interesting in showing, how sensitive the near logarithmic dependence on CO2 concentration is on some details that might very well differ from the real case. The logarithmic dependence is not forced by fundamentals but is only observed to apply fairly well over a wide range of concentration. At some point the deviations will start to grow both going down and going up in concentration. I haven’t had a spare minute for the Science of Doom blog for the last few months – sorry to everyone !!!! – but should be able to check out this point on the weekend. The reason might be in the handling of the stratosphere. I didn’t check the values at 20 km, but at the top of the whole AFGL profile that extends to 120 km. At high CO2 concentration the role of the stratosphere may get important. Thus neither excluding the stratosphere nor including it as simply as I did is likely to give really meaningful results. I didn’t even include the Voigt profile although I have that in my version of the model. If you included the stratosphere but didn’t change the temperature profile, forcing would be even less because emission from the stratosphere would increase. That’s why I used an observation height of 20 km. The keeps the bottom of the CO2 dip flat. I don’t think it has anything to do with the Voigt profile either. 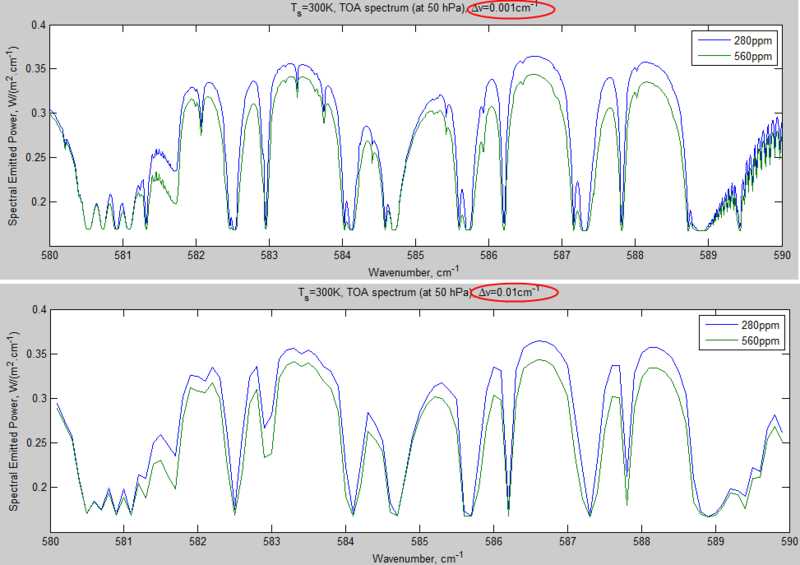 Perhaps you should plot some of your emission spectra and compare them to MODTRAN. The MODTRAN data can be obtained by clicking on the ‘view the whole output file’ link below the graphs. As far as I can tell, it always saves the text. My code is essentially that of SoD. At various points I have made some additions like calculating the azimuthal distribution of direction of radiation explicitly or adding the Voigt profile. The data is from HITRAN and other sources listed by SoD. I’m pretty sure the code does these calculations correctly, but I may have done something wrong, when I did the calculations that gave those results. I haven’t used the model since January, and it’s not very user friendly. Therefore I picked one earlier set of parameters and used it as starting point. I may have missed some exceptional values among the parameters, and that may affect the outcome. Sod wrote that he might also do the calculation. It’s interesting to see, what he gets out of his model. The recent discussion here has brought up that using the Lorentz line shape without some form of cutoff (or chi factor) may be largest source of error in your model. In case of water vapor the continuum contribution may largely represent double counting of the Lorentzian tails, but it’s also possible that the added continuum is so much stronger that the double counting issue is moot. The water vapor continuum is so strong because water molecules stick together and this effect is not included in the Lorentzian line shape. The very strong effects seen in my calculations have rather little influence as long as the CO2 concentration is well below 1000 ppm, but there may be some significant effects from closer to the main absorption peaks at smaller concentrations as well. I added a cutoff to the Lorentz line shape multiplying with a secondary Lorentz shape of half width 6 1/cm. This value is taken from the the poster of Shephard et al that I linked in a comment above. The curve they present in the poster agrees fairly well with Lorentz shape and a product of two Lorentz functions has a strong enough cutoff to make details of the tail irrelevant. They do still differ but much less than before. My results are also now much closer to the logarithmic dependence on concentration as the differences are 14.9 and 18.3 (DeWitt’s MODTRAN results have differences 12.0 and 14.7). My results at the top of the whole range (82.5 km for this profile) are actually closer to MODTRAN results (for 20 km) being 282.0, 270,3, and 258.2. They follow furthermore almost perfectly the logarithmic dependence. where ν_c is the central frequency of the line. That factor does not lead to any cutoff. It’s effect is to make the peak slightly asymmetrical. It’s influence on the results is very small, may be too small to see at all. for determining the cutoff wavenumber distance. (I) A maximum distance, WNMAX, in waveriumber. The contribution from lines more distant than WNMAX cm-‘ are not included. (2) Maximum number of Lorentz halfwidths NL. The contribution from lines greater than x(LNL from a spectral position are not considered.This criteria is not allowed to be less than aD ND, to accommodate low pressures. ND has a default value of 6, but can be assigned by the user. 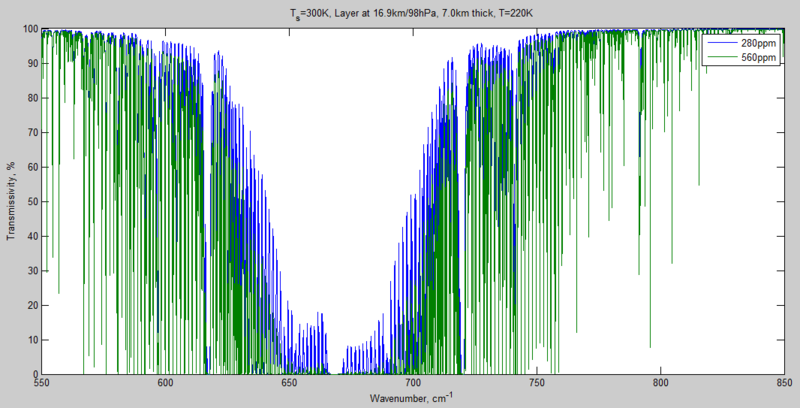 (3) A minimum optical depth, TDLMT, for the center of a Doppler broadened line. Lines that would contribute less than TDLMT in optical depth at line center, if they were only Doppler broadened, are not included. (4) A minimum optical depth, ODMIN, for line wing contribution. Line wings are cut off where optical depth is less than ODMIN. Thus there’s no cutoff function in LinPak, just a crude procedure of full cutoff with user adjustable parameters. Search with words “modtran far tail cutoff” finds several papers. The impression that I get from those papers is that a cutoff is applied at 25 1/cm off the peak, but I’m not fully certain that I have understood correctly, what the papers tell. Note that a limitation of PyTran is that it uses a cutoff Lorentz line shape to synthesize absorption from line data. This is mainly to keep things simple and easy to understand, and it covers most cases of interest adequately well. However, a “professional strength” code should use the Voigt line shape instead, to allow for the dominance of Doppler broadening near line centers when pressure is low. In addition, to get the line overlap right in high pressure situations (including Early Mars) one ought to consider a more careful treatment of the non-Lorentz far tails of collisionally broadened lines. The student who wishes to explore these effects (the latter of which is leading-edge research) will find it easy to modify the code to accomodate different assumptions on line shape. Interesting discussion and unfortunate that I haven’t had any time to engage recently on this. My take on it – the MATLAB model may have some flaws, I’m sure it has some. It is quite faithful to the professionally produced heating and cooling curves for current GHG concentrations. It produces spectral results for doubling CO2 similar to professional calculations. Pekka has got further than I have with azimuth calcs and the Voigt line shape. So far neither of them appear to have a big impact so far. But once we get to much higher concentrations of CO2 the MATLAB model needs validation. Whether MODTRAN or our model is better at very high concentrations of CO2 is hard to determine without some professional opinion. It’s easy for me to expect MODTRAN to be better but it is a parameterized model and our MATLAB model is a first principles model. So who can tell? We would need to compare results with a professional LBL model. I’m pretty certain that your model without any cutoff for far tails reproduces spurious results at concentration over 1000 ppm. I’m less certain on the relative accuracy, when the cutoff is introduced by a Chi Factor that follows closely enough the curve presented in the poster of Shephard et al. With that function is plausible that the modification of your model is more correct on the cutoff than typical MODTRAN runs. There may be some additional points not considered by either of us, where MODTRAN is better even at high concentrations. and gave the value 6 for the cutoff parameter. I must confess that I have misunderstood what science understand as the basic mechanisms in global warming. I thought it was the decrease in outgoing LW with an increase of CO2. But I now see that it is the increase in albedo, increase in SW reflected. Most climate models have a forecast of increasing longwave radiation out, at TOA, if the CO2 content goes up to 728 ppm in 2100. Bob Tisdale has run the CHIMP5 models, to look at the forecasts and the hindcasts. For me it was some surprising results, and even more surprising that there has been so little attention to this. I am sorry. It should be a decrease in short wave radiation out as the mechanism behind global warming. I have clearly messed this up. What strikes me is that LW up at TOA is increasing to 2100, but to a very little extent, and to a level which is lower than in 1875 (according to model mean). And that lower SW radiation up at TOA is the main driver of warming. on August 15, 2015 at 3:17 pm Mike M.
The mechanism of warming is a decrease in outgoing LW. For the purpose of illustration consider what would happen following a sudden increase in CO2 with a fixed albedo. The increase in CO2 causes an increase the optical depth in the IR, so that emissions are, on average, from higher and colder parts of the atmosphere. That causes a reduction in emission, according to the Stephan-Boltzmann law. As a result, more energy is then going into the lower atmosphere than is coming out, so T goes up. That causes IR emission to increase until a new balance is achieved. When that happens, outgoing LW is the same as before the CO2 change, since both must be equal to the incoming SW. 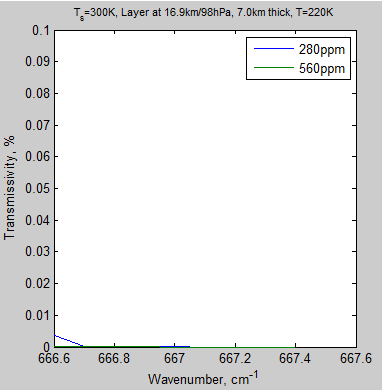 But after the CO2 increase, the surface T is higher than before. In reality, the albedo may not be fixed. The increase in surface T will cause changes in the water cycle, and therefore clouds, as well as changes in seasonal snow and ice, vegetation, etc. Those might change the albedo and incoming SW. But those are effects that in turn cause further change; i.e., feedbacks. In the model outputs that Tisdale plotted, everything is happening at once, so you can not readily deduce cause and effect from those plots. I would think that Tisdale has the same model runs that comes up in IPCC reports. This scenario RPC 6:0 come up with a CO2 content of 728 ppm in 2100, it is a doubling from 364 ppm, which was reached in 1997. So we can follow what climate science see as the most probable development for CO2 doubling out of that scenarium. If we level out the strong peaks of 1997 and use year 2000 as starting point, we get about 1 watt/m2 increase in TOA LW out, and 2 watts/m2 decrease TOA SW out for the double amount of CO2. This is CHIMP5 models mean. So with a doubling of CO2, the average model calculate that the effect of lower radiation of SW is counteracting stronger LW radiation twofold. With a CO2 forcing of 3,7 watts/m2 (for CO2 doubling), which should be a stong LW decrease, the atmosphere has a lot of work to do to get in balance. nobodyknows: The basic mechanism of GHG-mediated global warming BEGINS with the decrease in outgoing LWR at the top of the atmosphere. However, that decrease is the net result of two large changes: doubled probability of absorption of outgoing photons by doubled CO2 and doubled emission of outgoing photons by doubled CO2. The decrease occurs because absorption reduces OLR emitted from below – where it is warmer and more photons are emitted per GHG – while emission depends on the local temperature. You can perform reasonably sophisticated radiation transfer calculations using online software (MODTRAN) and see for yourself how much OLR and DLR are changed in different regions of the planet by GHGs. These calculations depend on absorption coefficients measured in the laboratory and typical observed temperature, humidity, lapse rate and pressure at various locations in the atmosphere. (MODERN is not a “climate model”. The temperature shown is the typical surface temperature for the region you chose – it is not calculated.) The typical figure cited for reduction of OLR by 2XCO2 (3.7 W/m2) is a composite of clear and cloudy skies in tropical, temperate and polar regions during various seasons “looking down” from the tropopause (ca 15 km). A blackbody at 255 degK emits as much radiation and as our planet absorbs on the average from the sun (240 W/m2). It is simple to calculate that the temperature of a simple blackbody at 255 degK needs to rise 1 degK to emit an additional 3.7 W/m2. IF the planet were a blackbody, such a rise would restore the alance between incoming and outgoing radiation after a doubling of CO2. A more sophisticated calculation takes into account the actual temperature (ranging from 210 to 310 degK) where photons are emitted. This produces a “no-feedbacks climate sensitivity” of 1.15 degK. However, the earth is not a simple blackbody. Upon warming, water vapor (a GHG) is likely to rise, rising humidity will reduce the lapse rate (reducing surface warming compared with the upper troposphere), clouds will change (there is less cloud cover during summer), and less snow and ice will reflect less SWR back to space. These “feedbacks” are likely to amplify the warming directly caused by GHGs reducing outgoing LWR: from 1.15 degK to 1.5-4.5 degK (15-85% confidence interval) according to the IPCC. The lower heat capacity of the northern vs southern hemisphere causes GMST (before taking anomalies) to rise and fall about 3.5 degK every year. With satellites, we can observe how outgoing LWR and reflected SWR change in response to this change in temperature. You can see those results in Figures 1 and 2 of the paper below. If there were no feedbacks, reflected SWR would be unchanged and OLR would increase by about 11 W/m2 for a rise of 3.5 degK ( 3.5 K * (3.7 W/m2 / 1.15 K) ). However, the global increase in OLR is only about 8 W/m2. This decrease in can be seen from clear skies where only water vapor and lapse rate feedbacks are relevant. Since there is land covered with snow in the NH than the SH, there is also a big seasonal difference in reflected SWR from clear skies. Outgoing LWR and reflected SWR from cloudy skies behaves similarly to that from clear skies. This paper clearly shows that current climate models do a poor (and mutually inconsistent) job of reproducing large SEASONAL changes in outgoing LWR and reflected SWR, casting serious doubt on their ability to properly represent the fast feedbacks important to GLOBAL warming. So what does it all mean? Doubling CO2 (or its equivalent) will cause MODEST warming (1.15 degK) by reducing OLR. That warming will be amplified by feedbacks that we can seasonally detect from space. Climate models aren’t capable of representing these seasonal feedbacks, so we can’t their estimate of how much feedbacks will amplify global warming. The IPCC admits that a wide range of future warming is possible: 1.5 to 4.5 degK per doubling of CO2. The amount of warming we have experienced from the current increase in GHGs is most consistent with the low end of this range, 1.5-2.0 degC. However, climate models and some climate scientists believe that anthropogenic aerosols have increased the reflection of SWR by clouds and reduced current warming by 0.5 degC – and that warming will be observed in the future when we burn less coal. I have looked a lite into this and there are some references. Looks like there is a new greenhouse theory. I take papers that rely on models as if they were reality with lots of salt. What that paper actually says is that the assumptions built into the models have increasing absorption as the major driver of warming. It says little about reality. Models don’t do clouds well. Clouds are the major contributor to albedo, not sea ice and snow cover. If higher specific humidity leads to more cloud cover, absorption of incoming radiation could decrease. OTOH, the areas where sea ice and snow cover contribute to albedo could be replaced instead by cloud cover and there would be no change. Seasonal changes are too high frequency to tell us much about longer term changes. The fact that models get seasonal changes wrong too isn’t confidence inspiring. There is still only one theory for GHG-mediated GW: Reduction of OLR followed by feedbacks associated with the rising temperature produced by the reduction of OLR. However, disagreement about the magnitude and mechanism of various feedbacks creates the illusion of multiple theories. It is critical to distinguish between forcing and feedback: a) Forcing is the net instantaneous change – usually calculated – in the planetary radiative imbalance (in both the LWR and SWR channels.) Forcing is reported in terms of W/m2 of per unit change in the forcing agent, for example 3.7 W/m2 for a doubling of CO2. b) Feedbacks are measured in terms of W/m2/K: How much does outgoing LWR PLUS reflected SWR change in response to a change in surface temperature; NOT to a change in GHGs. Cloud feedback involves changes in both emission of outgoing LWR and reflection of incoming SWR. Fewer clouds on a warmer planet will allow more SWR to be absorbed and more LWR to escape. These are two mechanisms that produce cloud feedback. Lower (warmer) cloud tops emit more outgoing LWR and higher cloud tops emit less outgoing LWR. Changes in the altitude of clouds provide another mechanism for “cloud feedback”. AR5 discusses cloudy regions shifting slightly towards the poles, a fourth mechanism. Different types of clouds reflect and emit differently. Changes in cloud type provide a fifth mechanism. Figures 3 and 4 in the above Manabe PNAS paper show that climate models seriously disagree with each other about how emission of outgoing LWR and reflection of SWR should change during the seasonal 3.5 degK increase in GMST. This internal disagreement guarantees that most AOGCMs get cloud feedback wrong. No model agrees with what satellites observe, so no model is fully correct. In the long run, it makes no difference if warming is produced mostly by changes in OLR or mostly by changes in absorbed SWR. The SWR changes are produced by WARMING and are therefore FEEDBACKS. The warming is INITIATED by the change in OLR caused by GHGs – FORCING (aka the enhanced GHE). AOGCMs do not predict cloud formation from basic principles. Cloud formation and other processes are controlled by parameters that are tuned to produce climate somewhat like today’s. There is no unique set of parameters that does the best job at reproducing current climate. Each model and parameter set is a different hypothesis concerning how our climate behaves and those difference can be huge: 2-231 years to restore initial OLR. Frank. I don`t understand the restoring of OLR. Models show a steadily growing difference between OLR and SWR over nearly 100 years, with steadily growing feedbacks. Why should it turn back and restore the initial values. Could some feedbacks become permanent, and OLR stay higher even if it goes 200 years? And even if the emission of CO2 is reduced after 100 years? To the discussion if there is a new theory of the greenhouse. I think there has been a shift in the understanding of the effect of GHGs over the last 10 years. There is a recognition from many scientists that older wiews have been misleading on the global warming mechanisms. When OLR at TOA was measured from satellites, it became clear that there was an increase in radiation to space in a period with strong increase in level of CO2 and strong global warming. This gave scientists some difficult problems to deal with. There has been no, repeat no, change in the understanding of the mechanism of the greenhouse effect. Increasing ghg’s create a radiative imbalance at the top of the atmosphere initially by decreasing outgoing LW radiation. The papers you quote are all about feedbacks as a result of that change. The net radiation at the TOA has always been incoming minus outgoing. Just look at the radiative balance diagrams. None of the things you mention, like cloud cover and albedo, can change until the temperature changes first. Obviously, if model coders understood feedbacks better and could properly model them, the AOGCM’s wouldn’t be so far out in left field that many of them are off by degrees on the absolute surface temperature. The predicted range in temperature increase from doubling CO2 would be narrower too. But this isn’t news either. Ok deWitt Payne and Frank. Then it is perhaps all about feedbacks. And I can agree that the findings from models can pose more questions than they can answer. But all the same, when it comes to the scientist`s understanding of the dynamics, it was not so clear cut. When Realclimate in 2006 attributed ocean heating to downwelling IR, without mentioning that most heating come from the change in net SW radiation, then it is tempting to say that there is a poor understanding of feedbacks and SW absorption. Maybe some confusion in the scientific community. No, it is all about forcing and feedback – and recognizing difference between the two. Units can be very useful for keeping things straight. Both forcing and feedback involve a change in the planet’s NET radiative flux (W/m2). Feedbacks are CAUSED by a change in temperature and are measured in units of W/m2/K. Forcing is responsible for causing a temperature change and sometimes measured in units of W/m2/unit change in forcing agent = 3.7 W/m2/doubling of CO2. The interaction between anthropogenic forcing agents and radiation can be studied in the laboratory and the results can be used to predict what happens in the atmosphere with a reasonable degree of confidence. There should be relatively little controversy about forcing. Feedback is the planetary response to warming and can’t be studied in a laboratory. A large feedback is roughly 1 W/m2/K and observed global warming is preceding at a rate of about 0.15 degC/decade. That means that even large feedbacks are developing at a rate of 0.15 W/m2/decade – which is essentially unobservable. So the feedbacks associated with GW can only be studied in AOGCM. These models become the only “reality” that can be observed with suitable accuracy and detail.